Singapore Association for Mental Health (SAMH) has been uplifting lives and promoting mental wellness for all since 1968. How we think, feel and act is influenced by our mental health. Cultivating mental wellbeing is key to a fulfilling and meaningful life. We provide a broad range of services across our 9 centres. These include counselling, creative services, outreach activities, rehabilitation, skills training and job opportunities. Let’s celebrate individuals who have overcome the odds, as well as those who have touched the minds and hearts of others. Be inspired by their stories. Get our latest news and periodicals here. Feel free to contact us directly if you cannot find the information that you’re looking for. What are the Secrets to Relaxation? For many of us who live in fast-paced society like Singapore, relaxation is not in our vocabulary. We are so preoccupied with the need to achieve that we often forget to relax. Guilt strikes us when we are not doing something productive or goal-oriented. Knowing how to relax is crucial for your mental and physical health. You will find that relaxation is a great buffer against stress and the demands of everyday life. Most of us know of activities that give us pleasure and help us to unwind. It could be something simple, like reading a book, or having an afternoon nap. Often, it could be something more. Here are a few approaches to the art of relaxation that you can try. After a hard day of work or school, most people find it a relief to unwind through some form of physical activity. It could be some low intensity exercises, such as yoga or tai chi, which help to increase flexibility, muscle strength and joint mobility. Or it could aerobic exercises, such as running, swimming, cycling and dancing. These can help strengthen the cardiovascular system and increase stamina. A game of tennis, squash or golf can also leave you feeling revitalised. All forms of exercise are effective in countering fatigue, insomnia and depression. Creative activities do more than just reducing stress and promoting relaxation. They can be fun, enriching and give you a sense of accomplishment. Painting, pottery, knitting and photography can all provide peaceful distractions or deep satisfaction. Even listening to music can allow you to ‘just be’ instead of always striving. Complete relaxation involves switching off the stimuli from the environment as much as possible, so that both the mind and body can be at rest. 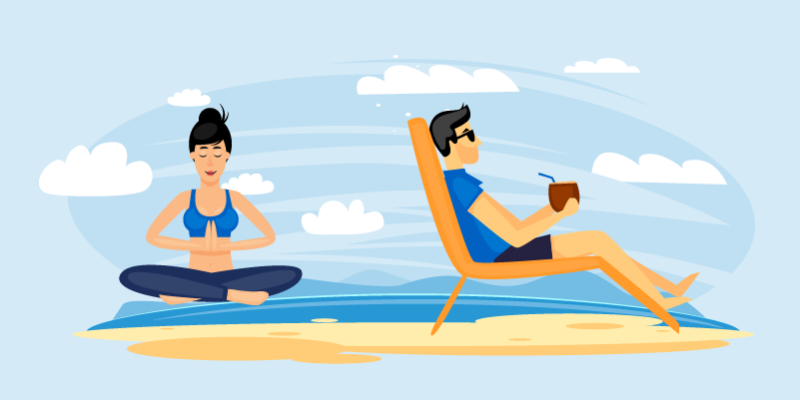 Progressive relaxation, autogenic training and meditation are recognised techniques in complete relaxation. Select one that suits you best and practise it regularly. All you need is a little time and commitment. The more often you practise, the more adept you will become at relaxation. Progressive Relaxation is a deep muscle relaxation technique to relieve physical tension. It was developed in 1929 by an American physician, Dr Edmund Jacobson. In the course of a day, we face many challenges at work, at home and in our environment. We react to this stress with tension, both mental and muscular. This technique calls for tensing and relaxing of different muscles in the body. It helps us learn to contrast the sensations of tension with that of relaxation. By tensing and relaxing muscles from head to toe, we can achieve whole body relaxation. Progressive relaxation can be easily learned and applied daily to reduce tension. The following is a procedure for achieving deep muscle relaxation quickly. Repeat each step at least once. Tense each muscle group from 5 to 7 seconds, and then relax it from 20 to 30 seconds. Remember to notice the contrast between the sensations of tension and relaxation. Get into a comfortable position, either sitting or lying down. Take a deep breath and let it out. Gently close your eyes and begin to relax. Turn your attention to your feet and tighten your muscles there. Curl your toes and arch your feet. Be aware of the tension, and then relax. Let yourself feel the difference when you relax. Tighten all your muscles in your legs, shins, calves, knees, thighs and hips. Hold the tension for a few moments, and then relax completely. Feel yourself slipping deeper into relaxation as you take a slow, deep breath. Tighten your abdomen. Pull in your stomach and chest, as if they reach through to your back. Hold and then relax. Clench both fists, tensing the biceps and forearms. Tighten as your arms lift slightly from the surface on which you are sitting or lying. Hold and relax. Wrinkle your forehead, purse your lips, clench your jaw and tighten your entire face. Shrug your shoulders and tighten the muscles of your neck. Hold the tension, feel it and then relax. Now tighten all the muscles in your body simultaneously. Tighten, hold the tension and then let it all go. Relax completely, breathe and rest for 1 to 2 minutes. Doctors throughout Europe have been practising Autogenic Training since 1910. The technique was developed by the German physician, Dr Johannes Schulz. Autogenic Training is based on auto-hypnotic methods. It induce certain types of body changes when we become quiet, such as a heavy feeling, warmth, regular heartbeat and regular breathing. This technique needs to be done in a quiet environment, with a passive attitude and through silent repetition of a verbal formula. Assume a comfortable position and close your eyes. Breathe in a slow and natural manner. Try feeling the heaviness in your arms as you say to yourself, “My arms are heavy”. Repeat this phrase slowly for thirty seconds, letting go of the muscular tension in your arm. Repeat this process with your legs, neck and shoulders. As you continue to breath, slowly say to yourself, “my arms are warm”. Feel the blood flow through your arms as you repeat the phrase. Repeat this process with your legs, neck and shoulders. Breathe naturally, while saying to yourself, “my heartbeat is calm and regular”. Next say, “my breathing is calm and regular”. Repeat several times. To complete this exercise, say to yourself, “I am refreshed and alert”. Take a deep breath, stretch and open your eyes. Meditation can be quick and effective in creating a deep state of relaxation. It teaches you to focus uncritically on one thing at a time. This skill of passive concentration can be applied to other areas of your life to increase your effectiveness in whatever you do. There are many ways to meditate. All you need is a quiet place, a comfortable position, a passive attitude, and an object to dwell upon. It can be a word or sound, an object or symbol, even a specific thought. Below is the Relaxation Response – a meditation technique developed by Dr Herbert Benson. Sit quietly in a comfortable position. Relax all your muscles, beginning at your feet and progressing up to your face. Do this by focusing your awareness on your feet, visualising them and silently saying “Feet, relax”. Repeat this process with each main muscle group. Breathe through your nose. Become aware of your breathing. Each time you breathe out, say the word “one” silently to yourself. You may use any word you want in place of “one”, such as “relax”. Continue for 20 minutes. You may at times open your eyes to check the time. When finished, sit quietly for a minute with your eyes closed. Take your time as you open your eyes. Do not worry about whether you are successful in achieving a deep level of relaxation. Maintain a passive attitude and permit relaxation to occur at its own pace. When distacting thoughts occur, do not force them away. Rather, allow them to pass in and out of your mind, like clouds passing overhead. Keep in mind the word you used in step 4. With practice, the response should come with little effort. Practise the technique once or twice daily, but not within 2 hours after any meal.